Me and my mom share a wonderful relationship. She is one of my best friends and just like I announced today on the Meow FM that my mom is my puke-box in a very good way. I mean its mandatory for me to puke out all the details of the day to her. She is the axis around which my whole world revolves. I could have pasted any photograph of both of us, but I wanted to continue with the theme of posting only the pics that I have clicked from my cell phone. 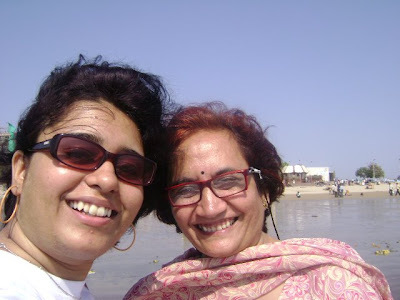 So here are Mom and Me having fun at the Girgaum Beach in Mumbai. Its a moment I would cherish for all my life. It's wonderful you and your mom have such a great relationship! I cherish my mom as well. Also, I'm liking the MeowFM site, it's a great concept! This is such a sweet post and you two look very close. Your mom is beautiful!